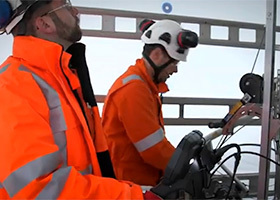 Wälischmiller have partnered with Shell and Statoil to develop the Telbot® for use in the gas industry. The industry struggles with tank inspection cleaning, currently performed by individuals in conditions which are high risk and involve significant downtime for the plant. The Demo 2000 project is adapting the Telbot® to inspect and clean tanks in an efficient and safe manner, removing human involvement and saving costs and time.